The skimmer, that mysterious little opening on one end of the pool, is exactly what it appears to be: a gutter where the dirty stuff floats off to die. An explanation of how a skimmer works can be helpful to keep the pool running properly and understanding how the pool stays clean. One of the simplest and most effective components of the system is the weir. A weir is the little plastic dam inside the mouth of the skimmer between the opening and the skimmer basket. The weir is hinged so it can move in the water. Its purpose is to allow a small amount of the surface water of the pool to ‘skim’ through, which also bring leaves, bugs, and other floating detritus into the skimmer. Once it’s there, it’s trapped by the weir and will be sucked into the skimmer basket. The skimmer basket should never be used as a place to put chlorine tabs. Contrary to the likable but erroneous notion of putting the chemical directly into circulation, as it were, chlorine can damage the components of the filtration system, since chlorine is a highly caustic substance. Also, the skimmer should have an equalizer line, which sends the skimmer water back out to the pool at large, thereby keeping the water level balanced. Never know what, or who, you'll find in the skimmer! Anyone who has emptied the skimmer basket knows the skimmer does a champion job at keeping floating things down to a minimum. The skimmer basket can be accessed by way of the skimmer lid, which is usually flush with the deck surface at the edge of the pool. Debris collected by the skimmer doesn’t float to the bottom of the pool and create a bigger problem. It’s well worth the effort to keep the skimmer clean during the summer swim season and after windy events or flower/leaf dropping seasons. Swift removal of debris will keep the chemical levels more stable and provide for a cleaner, nicer pool experience. The debris will not create a strain on the pump or system. The skimmer should also be in a handy place since it is used to clean the pool. The vacuum hose adapter is attached to the skimmer for vacuuming. There are various escape methods you can buy for critters who climb or fall into your pool. 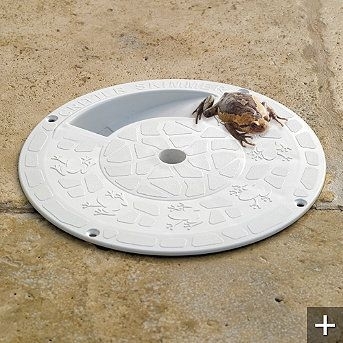 If you find yourself removing the tiny corpses of lizards, toads, and mice from the skimmer basket on a regular basis, you may want to get a Frog Log or other device to allow them a chance to escape before they’re overcome with chlorine and die. The escape platforms are about $22, but they cut down on the ick factor enormously. Many creatures fall into the pool after they are drawn to the bugs which are attracted by the light. As you can see, the skimmer does a fine service. There are a few other options to a skimmer, for example, a floating skimmer, which we will save for a future discussion.